Oh boy, oh boy, I hope we’re not late to send the invitations to you people, but thank you for coming to our tea party. Today, we have a special guest, drum rolls please (drum rolls and trumpets play in background). Ehem. Ladies and gentlemen, please welcome TARA GILBOY!! Tara is the author of Unwritten, one of my favorite middle-grade books so far and also the one that made me spill my tea. If anyone is interested with my thoughts, you can always check it here. Now, let’s begin the tea party, please be seated. Man, I’m always amaze with that beautiful cover, don’t you think so? Okay, here we have a twelve-year-old Gracie Freeman who is living a normal life, but she is haunted by the fact that she is actually a character from a story, an unpublished fairy tale she’s never read. When she was a baby, her parents learned that she was supposed to die in the story, and with the help of a magic book, took her out of the story, and into the outside world, where she could be safe. Oh wow, that was intense. So, now we have Tara here with us and she would be so happy to answer the questions that I’m sure you guys are wondering. Let’s head to the questions! So Tara, what was the most memorable thing when you wrote Unwritten? It can be good, it can be bad, or it can a wonder! The most memorable thing to me about writing Unwritten was how hard it was! This was by far the most challenging thing I’d ever written, and it took me a LONG time to get my plot and characters pinned down. Because of how many metafictional elements there are in the book, the plot in its early stages was very confusing to some of my workshop partners. “There’s a book within a book? And yet they use this book to travel between the story and the real world? Huh??”…. I think I left my critique partners’ heads spinning in circles! Luckily, I had so many wonderful critique partners who read draft after draft and helped me brainstorm until I was able to get everything just right. Perhaps I should have said the most memorable thing to me about writing Unwritten was how much help I had and how many great conversations I had with my writing buddies. I learned a ton about writing from trying and failing many times, and a lot of deleted scenes and pages later, I had a book! I read a review the other day where a reviewer called it a “simple” book, and I am taking this as the highest compliment, because I cannot even count the number of drafts it took me to make this premise simple and easy for child readers to understand. Unwritten started in a rather unusual way. I had written a different book for my MFA thesis, and I found an agent for it pretty quickly, so I really had my hopes up when it went out on submission, and then …. Nothing. It didn’t sell. This shook my confidence as a writer, and I was starting and stopping a lot of projects and feeling insecure about my writing. Finally I decided to write something just for fun, something that was just for me, that I never planned on showing anyone, as a way to make writing fun for myself again. Unwritten was my “just for fun” project. At the same time, I kept having this recurring nightmare where some sort of supernatural entity was coming after me, and I had to pack up whatever I could fit into my car and run away forever. That dream was initially my starting point in the story; in the early drafts, the story opened with a stranger arriving in the middle of the night and telling Gracie and her mother that they have to flee. (I think my original opening line was “The pounding shook the house” as this stranger knocks on the door.) Later, as I continued working on the novel, I realized that in order for readers to feel invested in that moment, they needed to know more about Gracie first, so the scene got pushed back into what I think is now chapter four or five, and it eventually evolved into something completely different. But the origin of this story was me exploring who Gracie was running from and why, as well as giving myself permission to play around with these ideas without pressuring myself to write something with the end goal of publication in mind. I think because of the premise of the book, people often assume I must have started with the “story-within-a-story” idea, but that actually wasn’t the case. Man, I could not imagine if the story comes to you and haunt you forever so you would write it. I sure hopefully you have a good sleep now. Okay so give me three words that you would use to describe Unwritten? Ooo, good question! Definitely magic. Adventure. And perhaps redemption. 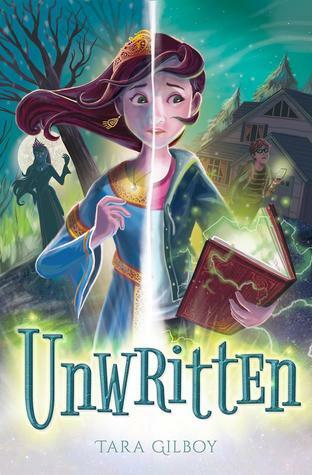 I can see that this book is middle-grade, so was there any challenge when you wrote Unwritten? One of the biggest challenges for me was that there are parts of the book that are a bit dark, and I knew I was always pushing the envelope a bit, because you do have to watch how much darkness or violence you can put into a middle grade. At the same time, I knew my story demanded a bit of darkness given my premise. I am not one for sheltering child readers – I think they are perceptive readers who can see through adults who try to censor themselves or are less than honest because they are trying to protect them, but I also would never want to include something that is inappropriate for this age group. The climax of the book (I don’t want to say too much here because I don’t want to give anything away) was especially challenging. I read a lot of middle grade books as I was writing this and looked closely at how dark they got and how other authors had handled violence or the threat of violence in middle grade. I hope I was successful at achieving the right balance of not overdoing it but also not sheltering readers at the expense of the story. What was your favorite part or scene in the book to write? I’ll tell you my favorite part, it’s when the truth came out, that shocked me! Is it too much if I say I almost spilled my tea? Because I did! I’m so glad that was your favorite part! (Though I’m sorry I made you spill your tea!) That scene is one of my favorites too! I worked for a long time trying to get that scene just right! Another one of my favorite scenes is the scene at the bookstore. It didn’t exist until almost my very last draft. I was struggling with a plot problem, and as soon as I had the idea, I knew it was right. I got so excited about it, I took the afternoon off, shut myself in my room, and immediately wrote it. I don’t think that bookstore scene changed much as I revised it. It had taken me so long to come up with it, and then it just kind of fell into place. Oh don’t worry for the tea, it’s worth it and I can always have another tea. Now, which character whom you feel relatable the most? I would say mine but then it would be spoiler, or is it not? This is such a hard question and such a great one! It’s funny because later in the book, Gertrude talks about how she puts a lot of herself into her characters, and I think this is true for me as well. I relate to Gertrude quite a bit because she is a writer, but I also relate to Mom and Gracie and Cassandra and Walter….. I think I relate to Gracie the most, mostly because of how flawed she is. Gracie can be stubborn and have a bit of a temper, which are also things I struggle with. But in the end, Gracie wants to do the right thing, and this is very important to me as well. I have a strong conscience that always let me know when I am not doing the right thing! Middle grade books are my favorite books to read – middle grade is all about good storytelling. They are the books that inspired me to love reading in the first place, and so they have always had a special place in my heart. When I first started writing, when I was in second and third grade, I started out writing middle grade, mostly because that’s what I read. But then I grew up and went to college, and I developed this idea of what it meant to be “Writer” with a capital “W” that involved lots of black turtlenecks, exposition-heavy stories full of metaphors and symbols, and words like “myriad” and “plethora.” I think I was in love with this “idea” of being a writer, but at the same time, I had lost my sense of what I loved about writing in the first place, which is that I love story. It was only when I took a class on writing children’s books in graduate school that I reminded myself how much I loved writing middle grade: the wonder, the sense of magic and adventure, the sense that anything is possible in these books as long as you are telling a good story. I fell in love with middle grade all over again and never looked back. I’ve been working on a lot of different projects lately, but I can tell that I have not forgotten about Gracie! I find myself daydreaming about her quite a bit and thinking about what she’s doing after the end of Unwritten. I’ve already written some scenes that take place after the events of Unwritten are over. So stay tuned! And thank you again Tara for coming to my humble tea party and sharing your thoughts of your book with us. I am so happy for that and I don’t know how to really thank you for that. I hope the best for you and remember Hatter would always welcome for another tea party should you need any! Now, I know you guys have been wanting to have a hand of the book and probably chat more with Tara, so if you want, let me give you the information you require. However, it comes with a price! All I ask is if you read the book, have time to give a review, and if you don’t, spare your time to do that, or if you can’t, just so you know I’m happy that you stay for the tea party! Even though only for the cakes and teas. Haha. It’s alright. Tara is available on twitter https://twitter.com/taramgilboy and you can also go to her website at http://taragilboy.com/ or if you’re just curious to see what she has for future works! Where can you have the book? And that’s it for now! Once again, thank you for Tara for accompanying us today and I really enjoy the time today and I do so hope you too. Good luck for your book and for your future, Hatter wish the maddest bestest for you!